I boxed up my layout in late April, even though we weren’t going to move until July. I figured since we were putting the house on the market on the first weekend in May, I didn’t want prospective home buyers picking and prodding at the layout. Fortunately, we sold the house that first weekend it was on the market. …but then I got real busy in the final stages of my PhD dissertation and defense, and I never did get a chance to set the layout back up. I’ve been hand-carrying all of my N scale trains (I trust the movers with the layout, but not the equipment), but they have no rails to run on. When I get to Nebraska, I’ll have a basement. There’s a room set aside in the basement that’s perfect for the layout, my workbench, and my railroad books. I plan to decorate it with my train pictures and railroad signs, and maybe even a display case. 1. Dual era structures and vehicles; one set for 1956, and one for 1980. 2. New scale-sized LED position light signals (I have these already; just need to build ’em). 3. Relaying track with code 55 (sorry, I just can’t take the oversized code 80 anymore, no matter how well it works. It looks awful). 4. New staging yard with greater capacity. Well, I can dream, anyway… I get my layout back on August 4th. The theory of "good enough…"
…or when to stop counting rivets! I thought about this as I tried to codify my own threshold of “good enough,” and it began to remind me of differential equations from calculus. “Good enough” is nothing more than a unique solution to an initial value problem. The red dashed line represents fun (scaled on a dimensionless, normalized range between zero and unity) and the solid black line represents work (scaled the same way). As a store-bought or scratch-built model becomes more and more accurate, it requires more and more exacting, tedious, and time-consuming work to accomplish. Theoretically, the amount of fun a modeler is having is simultaneously decreasing (i.e., the law of diminishing returns). The “sweet spot” is that level of accuracy whereby the modeler is still having fun but working hard to accomplish his goal; any more work and it stops being fun. Notice the curves are asymptotic; no model can ever achieve 100% prototype accuracy. 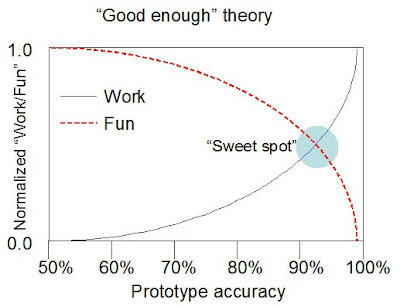 What makes this an initial value problem (i.e., the sweet spot is a unique solution to a very specific set of circumstances) is that the slope of these curves varies greatly from modeler to modeler, and from project to project. In other words, the skills, desires, and patience of the modeler affect the sweet spot location as does the choice of prototype, starting model (if applicable), availability of after-market details, paint, decals, photos, diagrams, etc. Not sure how that term came to mean flip-flopping on an issue (here’s a start), but since it’s election season, I’ll use it here. In 25 years I went from modeling standard gauge HO Santa Fe (thanks to my first Bachmann train set) to standard gauge western freelance to Rio Grande Southern in HOn3 to freelance turn-of-the-last-century standard gauge Colorado freelance in HO (based on the Colorado Midland) to freelance early teens central PA standard gauge coal hauler (based on EBT and H&BTM) to N scale PRR 1950s in 2002. And I’ve started waffling again. A few months ago I started building a Conrail roster circa 1980; this was early Conrail when many locomotives and cars still wore the colors of their pre-Conrail owners with sloppy “CR” stencils barely covering the old paint. In contrast, many locomotives and cabin cars wore the new blue and white (Penn State?) scheme. Cabin cars (cabooses to non-PRR/CR types!) were still very much in use in 1980, as were many PRR and Penn Central cars in their original paint. It’s a neat time to model. Plus, I was 6 at that time, and very impressionable. While railfanning with my Dad in PA at that time, we were usually in search of something more obscure, like the Stewartstown RR or the Maryland and Pennsylvania RR, but I always kept an eye on the Conrail/Amtrak mainline. I’ve been feeling nostalgic lately. 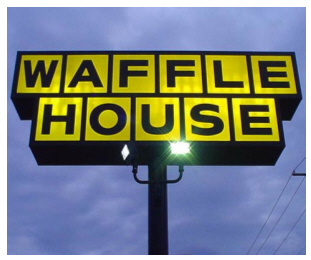 I guess it’s a half-waffle. I’m keeping the Pennsylvania RR equipment I’ve acquired and built. The good news is that the right-of-way didn’t change much between 1956 (PRR) and 1980 (CR). The structures and vehicles changed, and the trees grew up a bit, but the scenery, bridges, and signals remained the same. I’ve mused aloud elsewhere on the web about how I might pull off a “dual-era” layout; it involves swapping trains, vehicles, and some structures. The real bonus is that it will help keep my tiny layout more interesting for a longer time. I hope that it can stick with me at least until I retire from the Air Force. In the meantime, it’s a fine waffle indeed. 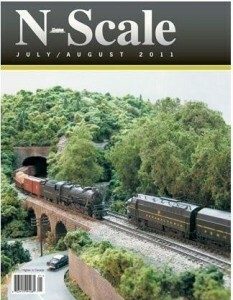 I recently read a post in the Trains.com forum blaming so-called “rivet counters” for making the model railroading hobby too expensive and “out of reach” for the common man. It was a very bitter post written by someone who was obviously frustrated and looking to assign blame (after all, doesn’t blaming someone else always feel better?). I took exception to that view… but other, more acrimonious posters that followed assured the thread was locked quickly. But the message is important; there’s still this stereotype of the mythical “rivet counter” who goes around putting other model railroaders down and demanding perfection from the manufacturers, driving up the price. That no one can cite an example of these people is irrelevant; the myth is enough to incite hatred of all things prototypical. Once upon a time they were also called “nit pickers.” The nit-picker was someone who put the work of others down because it wasn’t what he would have done. Usually nit-picking was accompanied by a dissertation of the nit-picker’s vast knowledge of the subject matter. – EDIT: Read the comments section to learn were the term “rivet counter” comes from! – Oddly enough, when I was in Civil War reenacting, these same beasts were called “stitch counters.” But then, most of us (in either hobby) took them in stride; we recognized their zeal to improve the standards of the hobby but dismissed their lack of people skills as the price. Believe it or not, such behavior is sometimes viewed as “uptight” and “mean” by some in the mainstream hobby. I mean, after all, who would know it if I got it wrong? …I would. And I model for me, not for anyone else. I can accept compromises (such as the driver diameter and valve gear for the M1 above; I couldn’t get an eight-coupled mechanism with the correct 72″ drivers and valve gear in N scale), but that’s a personal choice for me. I don’t force it on others, and neither have I seen other so-called “rivet counters” force their standards on the mainstream. Those of us who are deeply into prototype correctness tend to hang together in clumps where we can support and critique one another. …but for the rest of us who love trains and want our models to look just like them, we are grateful to the rivet counters who work hand-in-hand (in most cases) with the manufacturers to get it right. After all, there’s so much info available for free on the internet from blueprints to hundreds of thousands of prototype photos, that for a manufacturer to commit a major error on a model of a specific prototype is almost harder than getting it right. Many prototype railroads have technical and historical societies that will work with the manufacturer for free to ensure the new models are correct, including the rivets. I’m a rivet-counter, and I’m proud of it. My choice of modeling style is just as valid as laying EZ-track on a grassmat and does not impinge upon anyone else’s enjoyment of the hobby. There’s something very, very satisfying about watching a locomotive you built run past with a string of hopper cars, all with the right number of rivets! EDIT 2: I don’t profess all of my models to be exact to the prototype. That most are made slightly closer to prototype than when they first came out of the box is what’s important to me. This is only because of my deep, abiding love for the prototype (i.e., the real thing) and the resultant desire to better represent it on my model railroad, and not as a means to separate myself from the mainstream or assign myself some self-delusional elevated status among hobbyists. 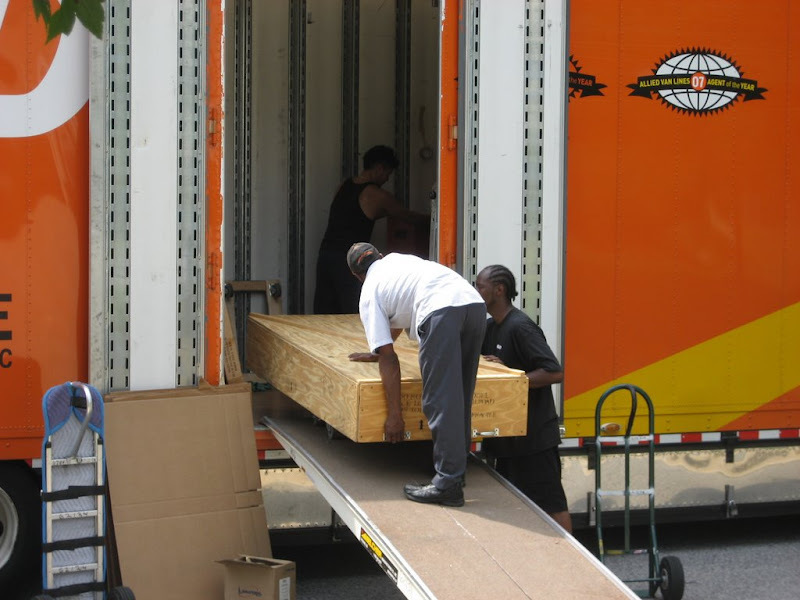 As part of the process of my military transfer (known as a “PCS” for Permanent Change of Station) from NC State University to Offutt AFB, NE, the “big orange truck” (as my son called it) came and took all of our stuff. Including my train layout. See, I had a 3′-wide hollow-core door layout when we moved here to North Carolina from Florida. 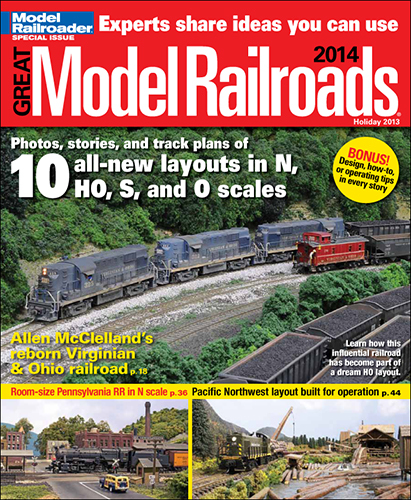 It was also based on the Pennsylvania RR. I eventually scrapped it for the current layout for reasons unrelated to moving. But, that layout made it to NC from FL without a single tree out of place. I’d built a crate out of 5/8″ plywood to transport it. Although I later cannibalized the layout, I kept the crate. Since the new layout is the same size as the old, the crate still fits. I’d post more about this, but I plan to submit an article to the model railroad press about it (assuming the layout makes it intact; I suspect it will). So, you’ll just have to wait! 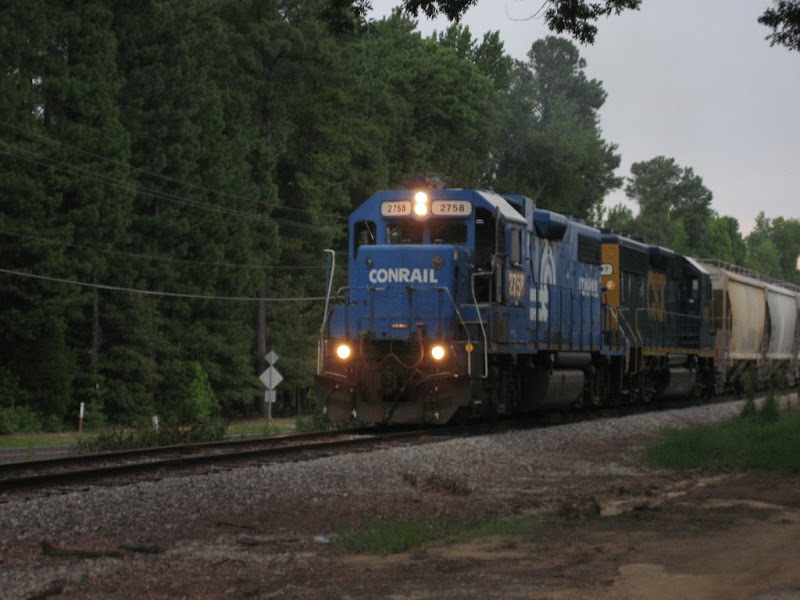 In 1999, Conrail was split up between Norfolk Southern and CSX Transportation after both railroads fought a bitter bidding war over Conrail which was eventually judged to be pointless. That was almost 10 years ago. So, the chances of catching locomotives still painted in Conrail Blue get smaller every year. In fact, Norfolk Southern has vowed to eradicate all Conrail Blue from its locomotive fleet by the end of this year. 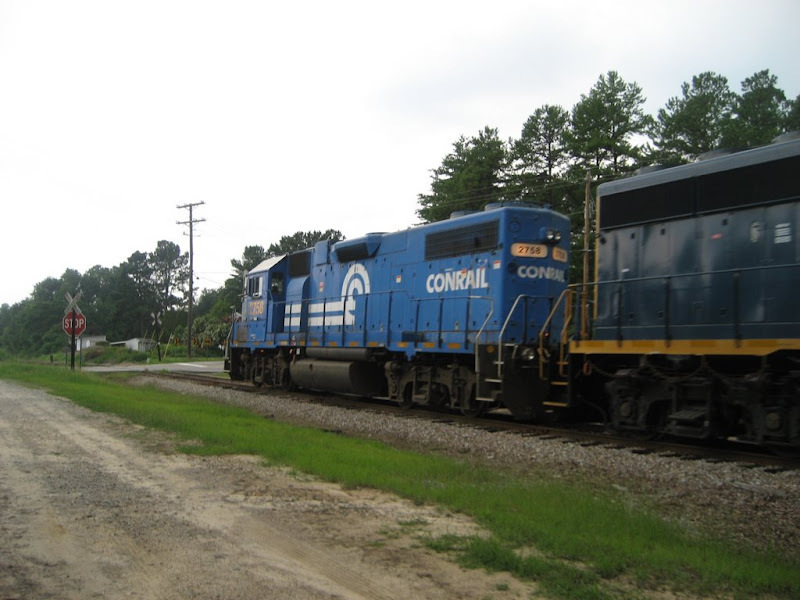 So imagine my surprise when I caught this GP38-2 on the former Durham and Southern line between Cary and Apex, NC on 10 July 2008, with a CSX re-number but still in Conrail blue. Notice the “can-opener” logo. Conrail introduced the Conrail Quality logo (sometimes known to railfans as the Q-logo) in about 1991. So this paint job has to date from about 1991 or early, since it doesn’t have the Q-logo. Wow. Still looks pretty good!